I do so love the Flavia books. 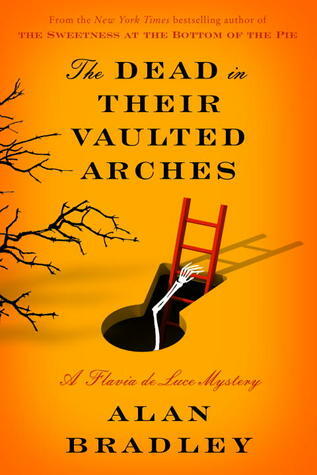 Today I read The Dead in Their Vaulted Arches by Alan Bradley. Wow. Just wow. It is hard to write about a book that is the sixth in the series without giving away things, not just the events of this book but things that would be massive spoilers for early volumes. Suffice to say that Flavia gets a lot of answers in this book, about her parents' involvement in World War 2, how Dogger came to be part of the household, and Aunt Felicity's importance. Flavia even meets Winston Churchhill. There are two murder mysteries, one old and one new, though the new one doesn't have much immediacy to it. It ends with big changes for Flavia. There are going to be 4 more books and I can't wait! If you haven't read this series, you really really should. I give this book a 7! I'm listening to the audio right now and am 3/4 of the way through it. I am loving it as much as all the others. I've been waiting patiently for the audio from the library and am so glad it finally came in...but then of course I'll be disappointed when it is all done. *Sigh* Such is the nature of books we love. Yes, as soon as I finish one of these I immediately go look to see when the next is coming out!